Art, history and a small child may seem like terms which don’t belong together in the same sentence. Yet, if you are a parent who loves to travel and explore the art and history of the places you visit, sooner or later you will find yourself in a position where you need to take your small child with you to visit a museum. That’s it, at least, if you don’t have a live-in nanny travelling with you. Most of us, though, either can’t quite afford this or may simply want to develop our children’s interest in art and history from a young age. communicating and then reinforcing a set of rules with regards to expected behaviour in museums and galleries. Now, let’s move onto the final six tips in the list. I hope you find them useful. Read on and at the end, remember to let me know what you would add to this list. Also, please, share with me some of your real-life experiences of bringing a small child in the realm of an art and/or history museum. In an art and history museum or gallery a small child is bound to see things beyond the realities of everyday life. Winged creatures, fantastical landscapes, broken (yet precious) ceramics, old coins, tools used to work the land many centuries ago, dainty jewels, gorgeous (yet totally impractical) outfits. Use every chance to talk to your small child about the objects you are exploring together. Tell him or her little stories connected with each item. You may simply read the notes provided by the museum on a small card by the artifact that has caught your eye. Or you may delve deep into your grown-up knowledge and try to distill it into simple terms so that your small child can understand the depicted story or the importance of the excavated artifacts. Nurture your child’s natural curiosity, point different things to him or her to look at, tell stories, build up whole worlds in front of their eyes. Make it riveting and fun. A Real Life Example: My little daughter is currently very interested as to who is who in the different paintings. She needs to know the story and the relationships between the painted figures. Here are the questions she asked me in front of a large painting by Tintoretto in the Civic Art Gallery in Palazzo Chiericati in Vicenza, Italy: What are these people doing here at the front? Why is this man ill? Is this girl taking care of him? What is he ill of? Does he have a tummy ache? Every painting becomes a story and every story leads to more questions. Sometimes it can be exhausting. Still, it can be fun, too. While at the same museum, we stopped in front of a centuries-old painting. An adorable cherub was blowing bubbles whilst holding a small bowl with soapy water. A seemingly random collection of fruit and vegetables lay at his feet. Two ducks were relaxing on the left hand side. ‘Why are those ducks there?’, my little daughter asked. ‘They are wondering when the cherub is going to give them one of the apples you see here at the front.’, I said. Cue much laughter and an otherwise long and tiring museum visit ending on a high note. You may be just like me and feel like you haven’t done a museum properly, unless you have seen every single exhibit up close and personal and read all the information provided, sometimes twice. Sorry to break the spell, but it won’t work like this when you visit a museum with your small child. You may find that you spend a much shorter time at the museum, most of which is actually passed looking and noticing things which, otherwise, you may have not paid any attention to at all. Your small child may walk right past a world renowned masterpiece only to stop in front of a small coin and look carefully (and for a very long time) at the outlines minted on it. He or she may even ask you such unexpected questions like: ‘Why I cannot sit on that?’ (while pointing to an antic piece of furniture which is cordoned off), ‘Why the windows are covered with shutters?’ (while tugging on said shutters) and ‘Why is the knee of the little angel in this painting red? Has he fallen?’ (completely missing the double meaning here). You may get a bit impatient at first and then a bit frustrated even. All these questions, this looking at the ‘not right’ paintings, statues and exhibits may feel like a huge waste of time, especially when you have paid a rather steep price for the museum or gallery ticket. Well, sooner or later, you will understand that in order to make the visit enjoyable and memorable both for you and your small child, you will need to start following his or her lead. You cannot force them to spend long times in front of every single exhibit, not even inside every single room. You cannot expect them to show the same sort of exalted appreciation you reserve for artists known all over the world. You cannot even hope that your small child will be able to see most of the things there from the point of view you see them due to a difference in heights and a difference in perceptions. Instead of getting frustrated, take it easy and just calmly walk around. See what your small child may be most interested in – beautiful landscapes, paintings depicting animals or beautiful ‘princesses’, collections of coins and so on. Spend time with your child getting to know what he or she is most attracted to in terms of artistic expression and historical artifacts. Nurture this interest by pointing similar and/or related things to him or her. Instead of obviously taking the dominant role, be prepared to take a figurative step back and let your child lead you from painting to painting and room to room. You can gently guide and coach your small child all along and point to him or her things of interest. Just don’t make it look like you are there just because of your own interest in the particular museum, rather than to spend a very special time with your small child. A Real Life Example: I love richly ornamented, stuccoed, and frescoed paintings and, here in Italy, I am in heaven with regards to this, as most palaces, castles and even old council buildings have at least one ceiling which you would want to simply lay on your back on the floor and admire all day long. I always tell my little daughter: ‘Look up! Look how beautiful this is!’, thus reminding her along the way that art does not always hang on the walls and can be present in different forms and places. At the same time, I let her chose the things she wants to focus on in each room of the museum and then we move on. I remember once there was this interesting collection of life-size statues dressed in old garments which I wanted to see up close. My daughter, on the other hand, found the statues quite scary and even though she didn’t say so, her body language clearly expressed her fear. I skipped that particular exhibit and I just made a mental note either to look for more information about it online or, if I am ever at the same place again, to attempt another visit to the same museum. Don’t limit your small child’s exposure to art and history just to the times spent by you two at art and history museums and galleries. Use every opportunity to spark his or her interest and keep it burning bright. Nowadays, there are many books about art and history written specifically for children of any age. Make it your goal to always explore the museum shop after a visit to the respective museum and buy a book or two covering the periods of art and history you have explored inside. It could be a colouring book, an activity book or a proper book with illustrations, which is also written in a simple language geared towards children. On the other hand, don’t stop at books. Many museums out there have whole ranges of everyday items (like pencil cases and sharpeners) plus small toys shaped like historical artifacts or with printed reproductions of famous works of art. In addition, use every opportunity to watch age-appropriate art and history documentaries with your small child. Make him or her see that art and history are not abstract concepts reduced to the isolated realm of museums and galleries. Instead, show your small child that art and history surround us on a daily basis and knowing them makes us feel more connected to the world and (in the grand scheme of things) helps us make better decisions for our future. A Real Life Example: After visiting the Escher exhibition in Treviso last year, we bought a set of play cards for our little daughter. On each card there was a geometric abstraction illustrating in a very simple way the complex illusions Escher’s work explores. Playing with the cards has been a lot of fun for the whole family. Visiting an art and history museum or gallery may be, at first, an overwhelming and, then, a stimulating experience for your small child. He or she will have a lot of questions. Nothing, he or she sees, will make sense to him or her at first. Listening to and carefully answering all the questions your small child will come up with will be your most important task during and after the museum visit. The questions will test your knowledge, your understanding of history and art, your patience even . But each answer you provide will be of utmost importance to your small child, as it will help him or her process the vast amounts of visual information he or she is accumulating all the way through the visit. Imagine finding yourself in a place that doesn’t make sense to you. It is huge and it is like a labyrinth. On the walls there are paintings, each telling a different story, and in big glass display cases there are items the purpose of which is not quite clear at all. Wouldn’t you be full with questions and impressions you would like to share? If you address each question and help dealing with each emotion, you will guide your small child towards establishing a connection with art and history as a whole. You will also help your child understand why art and history matter to you in particular and to people in general. Unfortunately, when visiting art and history museums and galleries with a small child you may find yourself in an unpleasant situation. Another patron or a member of staff may decide that you two are too much of a nuisance and make their opinion be known without much consideration for your feelings. Well, in case they are right (for example, your child was tired and making this fact known to all around you), a swift apology and retreat is in order. If they were not right though and you feel like they targeted you just because you were with a child and hence looked like a soft target, don’t be shy to stand up for your child. If you have paid for your tickets and were as respectful to the museum environment as everybody else around you, there is no need for you and your small child to bear the brunt of a disgruntled person. Be polite in your statement, but don’t fail to make it. Children, especially small ones, have every right to visit art and history museums and galleries. They need to experience art and know history in order to develop a real, deep interest in them. A Real Life Example: It pains me to tell you this, but my little daughter and I were at the receiving end of an overzealous museum employee only a few days ago. We walked into a long narrow room at the Civic Art Gallery of Palazzo Chiericati in Vicenza and found ourselves at the back of a large group listening to a guide telling the story of the paintings there. People had filled in the room to the brim and it was impossible for us to continue further. So, we stayed at the back of the room, as far away from the guide as possible. People were talking between themselves and taking pictures with loud shutter clicks. I tried to explain to her what the painting stood for. All the while our voices were barely above a whisper and it was clear that we were talking about the painting, as we were facing it away from the rest of the people. Suddenly, the member of staff in charge of the room flew towards us, grabbed my little daughter’s shoulder and ordered her to keep quiet. Needless to say, I was livid. Even if we were making noise (which we weren’t), the employee should have addressed me as the adult, instead of grabbing my little daughter. Also, to avoid such situations, she should have made sure that a path had been left free through the room, so that people who were not part of the guided group, could quickly walk through and out. Allowing for the room to be completely blocked (thus creating a potential fire hazard) and then taking her frustration on a small child who was actually interested in a painting, was unacceptable. Be mindful of how long you spend at an art and history museum or gallery with your child. Be ready to leave as soon as they feel tired, hungry or overwhelmed. Don’t endlessly push him or her to see ‘just one more room, just one more thing’. Appreciate the situation from his or her point of view. Also, be mindful that such things like your small child’s short height may impede them from seeing properly the exhibits. Be prepared to take your child in your hands so that he or she can see paintings and objects a bit better. Be ready to kneel next to him or her, so that you two can communicate more freely. Help your small child navigate the rooms full with people. Gently guide him or her forward and be ready to respond to his or her needs. In your life before parenthood a visit to a museum or a gallery may have been your way to commune directly with art and learn about history. Being there with your small child is a different experience altogether. As you lead him or her forward and, at the same time, let him or her take the lead, you will rediscover art and history in a brand new way. A Real Life Example: Glass display cases in museums and galleries often are at adult’s height. So, I pick my little daughter up and, reminding her that she mustn’t touch the glass, I give her a chance to have a good look at the exhibits. So, a visit to the museum can all of a sudden include some physical exercise, too. The most important thing for me though is that I am there to facilitate my daughter’s learning. 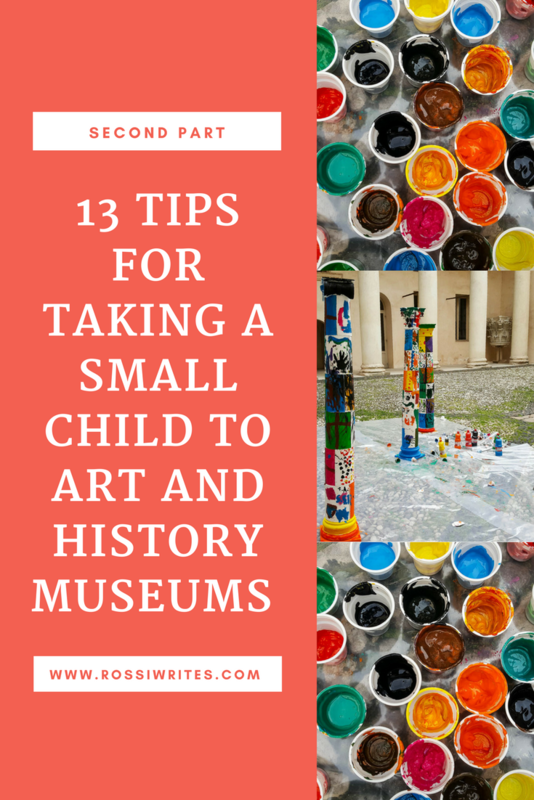 Here you have them – the six tips comprising the second portion of my blog post “13 Tips for Taking a Small Child to Art and History museums”. You can find the first part of this blog post here.